Be a Hero for a Hero! 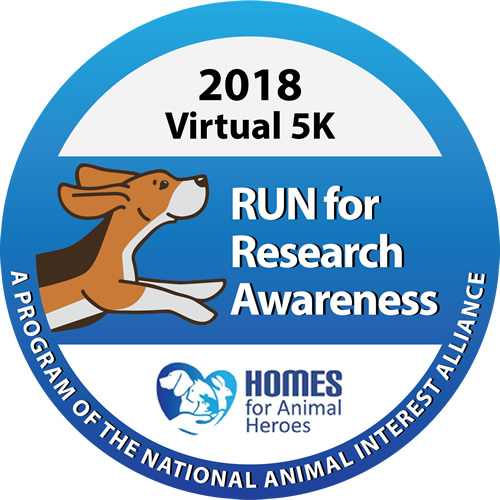 Last year was our inaugural Virtual 5K Run for Research Awareness. It was a huge success, exceeding all expectations. Animal professionals and dog lovers around the nation raised more than $80,000 to support Homes for Animal Heroes in California, Missouri, and Texas. Now, our goal is even greater. In 2018, NAIA seeks to expand Homes for Animal Heroes to a total of 10 states. With more than 3,000 dogs across our nation needing to be rehomed from biomedical research each year, the demands are tremendous. We want to keep growing, and we can, with your help! • Be an individual fundraiser, join a team, or start a team! In addition to the Resources provided here (Fundraising Guide, flyers, and handout), we’ll email tips throughout the campaign to keep you on the road to success. • If you aren’t able to participate as a runner/fundraiser, please make a contribution. • And everyone can help support the fundraiser by getting the word out to personal and professional networks. All funds go toward the supplies, veterinary care, foster care homing, and permanent rehoming of dogs after their contributions to biomedical research. The more we raise, the more homes we can provide! As a special thank you, all donors to the run will receive a window cling to demonstrate their support. * Raise $25 or more and receive a souvenir race medal. * Register and run with your dog, raise a minimum of $50, and we’ll add a Homes for Animal Heroes bandana for your dog. * Raise a minimum of $100 for a t-shirt, too. * Raise $250 or more, and we’ll include an insulated lunch tote. * Raise $500 or more, and get the grand daddy of prizes: a hooded jacket. All prizes will be mailed after the campaign ends on May 31, 2018. Please allow a up to 4 weeks for delivery. Prizes for team members will be sent to team captains unless otherwise specified. See below. Some team captains inquired about receiving items in time for their events this year. We are pleased to announce the medals and bandanas for dogs are available in advance, as well as race bibs for teams. For details, please see the event page and email your request to events@NAIAonline.org with a minimum of two weeks’ notice.